Harsh Canadian winters are tough on roads and automobiles. The weather can also wreak havoc on your garage door. Ice and snow builds up beneath the garage door, freezing it shut. Metal components contract and seize up in extreme temperatures. Old lubricating grease hardens when temperatures drop, gumming up the tracks. While some issues cause minor inconveniences, others can lead to expensive damage to your garage door or garage opener. Whether your garage is unfinished or you’ve invested in a snazzy garage renovation, you want to protect your home and the items stored inside your garage. Not all of the consequences of brutal winter weather can be avoided. However, a few preventive steps will greatly reduce the likelihood you’ll return home to the aggravation of a frozen garage door. Like many elements of your home and car, your garage door should be inspected regularly. From inside, with the garage door closed, do a monthly inspection of the door and its moving components. Examine rollers, pulley, cables and springs for damage or excessive wear. Confirm that the mounting hardware is securely fastened. If you see evidence of damage to cables or torsion springs, do not try to adjust them yourself. This can cause injury to you or severe damage to the garage door. Instead, consult a garage door professional who can take care of trickier maintenance and repair issues for you. If you don’t know one, a good garage renovation specialist can likely recommend one for you. The moving parts of your garage door require lubricant to slide against one another easily each time the garage door is opened or closed. The grease used to lubricate garage door parts can thicken over time. Debris also tends to collect in the tracks and on the rollers, interfering with movement. When air temperature dips considerably, the old grease and debris caught in the tracks tends to harden. This clogs the tracks and prevents normal operation of your garage door. To remove built-up gunk, use a damp cloth to remove debris and grease that has built up inside the tracks or on other parts. Once you’ve cleared away the hardened grease, get a good grade of silicone lubricant made for use with garage doors. For smooth, trouble-free operation during the winter, and year-round, all the moving parts of your garage door must stay lubricated. Spray rollers, bushings and hinges liberally with the lubricant. Then spray between the sections of the garage door to prevent them from sticking together during icy weather. Do not spray the spring, the chain, the bottom of the chain rail or the track. Check periodically to ensure that all components are lubricated and operating optimally. Reapply lubricant, as needed. However, be careful not to lube components too much. Too much lubrication can interfere with the alignment of the rollers and lead to a buildup of gunky grease again. Keep your silicone lubricant and any other household items out of the reach of pets and small children. A locked storage cabinet or high garage shelving are ideal for storing such household items. The weather stripping beneath your garage door plays an important role. 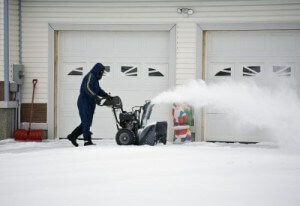 It prevents water, snow, ice and debris from entering your garage. Frequent use of the garage door puts wear and tear on the weather seal. When the weather stripping is compromised, water and dust can get into the garage and damage items stored there. Ice and snow will also build up beneath the garage door if the weather stripping is worn or damaged. If this happens, you could return home from a long day of work one wintry evening to discover that your garage door is frozen to the ground. Maintain your weather stripping to protect your garage door and the opening mechanism, which can be damaged when you try to raise a garage door that has been frozen shut. First, take a rag and wipe down the seal, inside and out. Then, thoroughly examine the weather stripping. Check for cracks, wear and missing pieces. Test the seal to ensure it is keeping cold air and moisture outside. If your garage door weather stripping has been damaged, replacing it is an easy fix. Purchase a good garage door seal and install it after removing the old one. If you’d rather not tackle the job yourself, a garage door professional can handle the job for you. For added protection in the event that moisture does get inside the garage, store items inside your garage above ground whenever possible. A good slatwall organization system, garage storage cabinets and overhead garage storage racks will keep your belongings high and dry if water or ice gets inside.